UPGRADE YOURSELF & EARN MORE MONEY! To register, please make 30% deposit for the course / workshop you are interested in by clicking the Paypal BUY button below. Taught by Sarah Jarvis, STOTT PILATES Canada Lead Instructor Trainer, specially invited to Singapore to give these course and workshops! 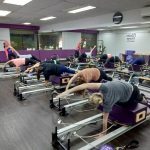 For the first time in Singapore, we are flying in full time Lead Instructor Trainer from STOTT PILATES HQ to teach the Reformer course – this is as close as it can get to flying over to Canada and take the course directly from STOTT! Sarah will bring with her not just a decade of Pilates knowledge but also the latest techniques fresh from the STOTT PILATES oven! Get 5% discount if payment is made before 22 May 2014! * Choose 3 workshops from (1) Prenatal Pilates on the Reformer Workshop (2) Athletic Conditioning on the Mat (3) Programming: Scoliosis Management or (4) Programming: Osteoporosis Management. Workshops are transferable.